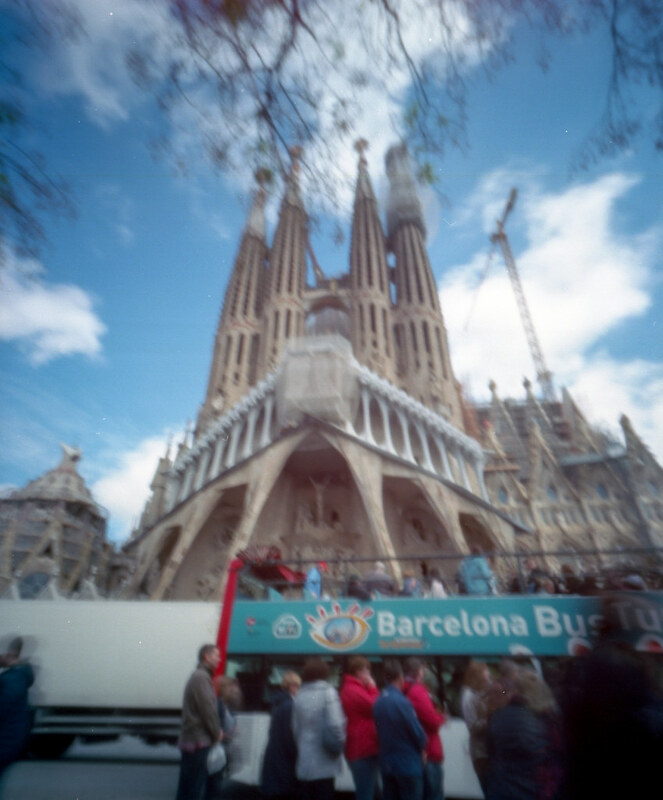 For World Pinhole Day I had the great pleasure of meeting up with a bunch of my pinhole photography friends in Barcelona, including my friends from this blog. Since I rarely travel without my pinhole camera these days I have a lot of pinhole shots of what some might call touristy sites. 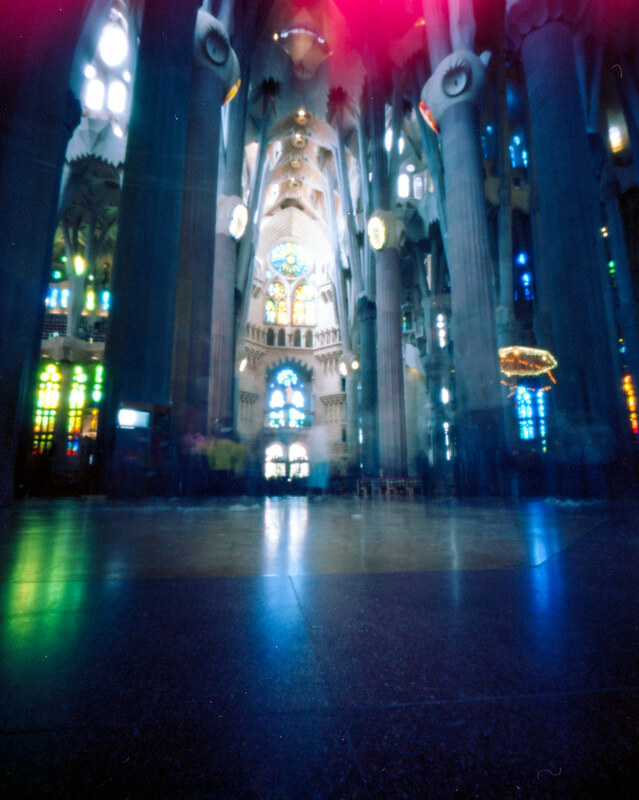 One of those touristy places is Sagrada Familia*. Sagrada Familia is an immense presence in Barcelona. You will know it when you see it. If you think you are seeing it but are questioning whether “that is it” (like I did on my first day in Barcelona) you are not seeing Sagrada Familia. Its architecture will hit you right square in the face and you will be awestruck by its immense size, and its oddness. The enormous crowd could also possibly give it away, too. Sagrada Familia is the masterpiece of Gaudi. It is still being worked on and they expect it to be finished in 2026. Guadi died in 1926. By the time it is finished it will have been over 100 years that construction has taken place! I find that incredible. Mostly that work has been able to carry on without him and his vision has been seen through. It really is an unbelievably amazing place, and photos (even pinhole photos) do not do it justice. It must be seen to believed. It must be experienced. If you visit, please don’t make the mistake of rushing through it like a tourist! Sit down and marvel at what you see before you. Gaudi was a master at capturing light. 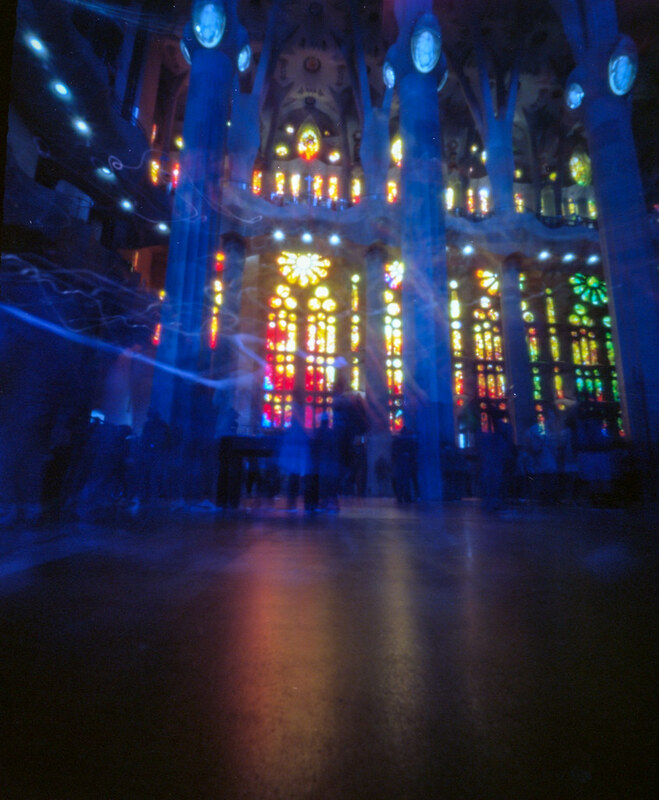 He believed that “Color was the expression of life.” He used red stained glass on one side and as you move through the cathedral it becomes blue. He took advantage of the rising and setting sun to set the inside of the cathedral ablaze with color at certain times of the day. I was simply blown away by it and can’t wait to see it again when it is finished. I am really glad that it will happen in my lifetime! All of these photos were shot with my Terrapin Bijou and Ektar 100. *I know that my friends also visited Sagrada Familia when they were there, so you may (Or may not) be seeing more photos from this amazing place. Great photos! In hindsight, I wish I had lingered longer than I did.